Russell Thomas as Roberto, Sondra Radvanovsky as Elisabetta. Cory Weaver photo. Since his name is not often uttered with the same reverence as others of the most famed opera composers, it may surprise many to find that Gaetano Donizetti is the fifth most produced worldwide. His “greatest hits,” L’elisir d’amore, Lucia di Lammermore, and Don Pasquale reign as popular masterpieces. But what would induce some of the great sopranos to plumb his repertory to perform works that rank in the second hundred in frequency of performance among operas? Witnessing Sondra Radvanovsky’s electric bel canto portrayal of Elisabetta (Elizabeth I, Queen of England) in Roberto Devereux will dispel any questions about the motivation. Her performance of this challenging showcase of vocal and acting prowess will be etched in the opera memories of those fortunate to see it. Donizetti is recognized as a master of bel canto, with its vocal ornamentation, agility, vibrato, glissando, and precise demands on breath and register control. Although not designed as companions, he wrote operas of three queens in that style, now known as the Tudor Trilogy – Anna Bolena, Maria Stuarda, and Roberto Devereux. Note that Elisabetta is the main character in the last of the three, but each of the operas is named after its victim. A clutch of great bel canto sopranos including Beverly Sills and Monserrat Caballé have taken on all three roles. Radvanovsky joined an illustrious group two years back, singing the three to triumphal acclaim, in one season at the Metropolitan Opera. Incredibly, those productions included the house’s very first presentation of Roberto Devereux. The title character is the dashing rogue, the Earl of Essex. As a military commander, he has countermanded Elisabetta’s orders in the field of battle, and is charged with treason by Parliament. Although he is more than 30 years her junior, the queen has interpreted Roberto’s friendship and flattery as romantic. He feels certain of the queen’s protection and has a great ally and defender in the Duke of Nottingham. But unbeknownst to Elisabetta and to the Duke, his wife Sara and Roberto have shared a pledge of love. The storyline is dramatic and of historic significance. And the music’s power and urgency is in concert with the plot. What the opera lacks in memorable tunes, it compensates with a strong melodic score that provides opportunity for vocal virtuosity. But this piece is all about Elisabetta. And though the role demands bel canto skills, it stretches the limits of the style to the extent that Joan Sutherland avoided it. Possessing intense dramatic quality and great range, including rapid descents into lower register, many sopranos find it daunting. Radvanovsky’s upper range is slightly harsh for some bel canto, but it perfectly suits the character of a spurned woman, nearly broken in body by age. Her transitions into the chesty range are chilling, and she powers her way through to the bitter end – “Vivi, ingrato, a lei d’accanto.” While much credit goes to the makeup and wig designers for Elisabetta’s decrepit look after removing her public wig, Radvanovsky owns Elisabetta’s radical transformation from imperious monarch to dispirited and hobbled old woman. Her vivid characterizations match her singing. San Francisco Opera’s staging pleases the eye. Using one fixed set, the look appropriately mimics the Elizabethan Globe Theatre. Walls of unfinished, framed panels and a symmetry of stairways, dominated by parallel lines, is topped with three levels of darkened galleries. Of the numerous moving props, most striking is the use of dark dioramas with haunting depictions of deceased royals. After Radvanovsky’s glowing success in Roberto Devereux in New York and San Francisco and her scheduled performances at Bayerische Staatsoper, perhaps the piece will gain greater traction in the repertory. It offers exceptional challenges for the principal cast and a rewarding experience for the audience. 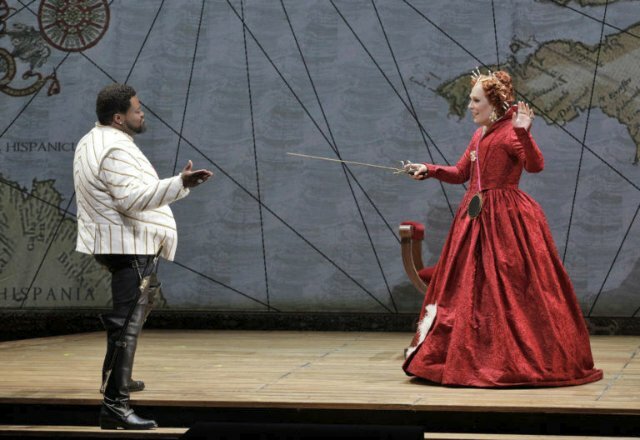 Roberto Devereux composed by Gaetano Donizetti with libretto by Salvadore Cammarano is produced by San Francisco Opera and plays at the War Memorial Opera House, 301 Van Ness Ave, San Francisco, CA through September 27, 2018.